SETsquared Bristol has just recorded its most successful year to date in 2017. The world-class incubator has over 80 active members who collectively raised over £130m in funding, an increase of £90m in funding on the previous year. What’s more, it created 1,300 new jobs in the region, and pushed new boundaries in gender and tech diversity. Several SETsquared Bristol members secured funding for continued and accelerated growth. Graphcore, who are becoming world leaders in AI and Machine Learning, raised $80m and Xmos obtained $15m investment to accelerate their work in voice and audio interface technology. University of Bristol spinout Zeetta Networks have grown commercially raising a total of £4m in funding last year, moved into new offices, and recently graduated to exclusive SETsquared Bristol Alumni status. Aside from funding success, attitudes to gender diversity in tech have been at the fore over the past year. The high tech incubator now has 11 female founders and over 25% female employees, an example all members are encouraged to emulate in 2018. 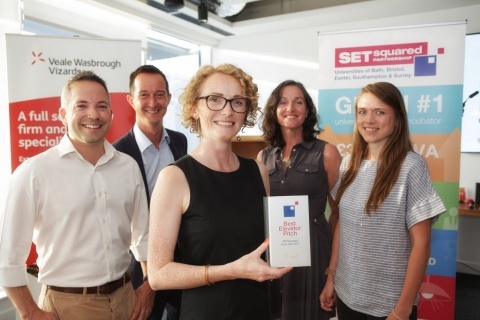 SETsquared Bristol has further championed gender diversity working with the Female Founders Forum, delivering Women’s Tech Hub interviews, engaging more female advisors, and reviewing and improving resources to support women in the sector. But gender isn’t the only diversity focus. A new SETsquared Bristol funded research project coming this year will delve deeper into understanding ethnic diversity across the tech sector. Sector diversity is another strong point for the incubator, with members spanning 37 industry types, from aerospace to agriculture. Other highlights include SETsquared Bristol’s partnership with Oracle, who chose Bristol as the location of their first UK Start-Up Cloud Accelerator, with the second cohort to be recruited in early 2018 – a great success for the region’s tech ecosystem. SETsquared Bristol was also selected by UK Digital Catapult to deliver the IoT Boost programme. Kairo, one of the IoT Boost supported companies, won the Best Elevator Pitch award at the SETsquared Tech-Xpo showcase in June. The SETsquared Bristol team has also expanded with the arrival IoT Entrepreneur in Residence, Pete Keevil and Community Manager, Paul Forster.